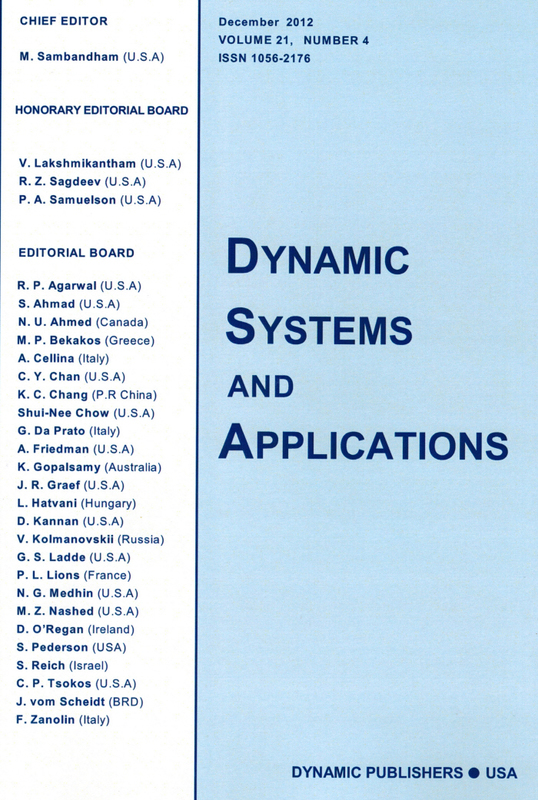 Academic Solutions Ltd. and Dynamic Publishers, Inc. (USA) publish jointly high impact articles, books, and monographs. This joint publishing activity is a continuation of the logistic cooperation and know-how sharing between Academic Publications Ltd. and Dynamic Publishers Inc. in the course of more than 20 years. Math. Reviews (since 1992) and MathSciNet (see also http://www.ams.org/msnhtml/serials.pdf). Web of Science (Thomson Reuters Corporation): Journal Impact Factor: 0.359 (2017); 0.362 (5 years). Google Scholar (Harzing's Publish or Perish): Cites/Paper (impact): 7.41, Citations: 7378, H-index: 37, G-index: 54. The journal publish carefully selected original research papers on dynamical systems in their broadest sense (covering ODEs, all kinds of PDEs, FDEs, difference equations, functional equations), integral inequalities, control theory, approximation theory, calculus of variations, optimal control, optimization, numerical analysis, differential games. Applications include the modeling and analysis of engineering, biological, economic and industrial problems. Papers for publication will be communicated and recommended by the members of the Editorial Board.